Lukwago vowed to complicate the lives of legislators supporting the removal of Article 102(b) of the 1995 Constitution. Courtesy photo. KAMPALA–Two days after the majority NRM party legislators backed the move to lift the Presidential age limit, some opposition figures in Kampala city are planning to conduct campaigns against it. Led by Erias Lukwago, the Lord Mayor of Kampala city, opposition politicians vowed to complicate the lives of legislators supporting the removal of Article 102(b) of the 1995 Constitution. “This is a judgment call to all the political leaders. You will either be for political stability of this country or history will judge you harshly,”said Lukwago during the press conference held at his office at City Hall. PML Daily has learnt that starting next month, the opposition figures will conduct campaigns across the city, calling upon city dwellers to put pressure on NRM party legislators to abandon the scheme. The campaign, according to Lukwago and company, will also be taken to churches and Mosques, introduction ceremonies and other social functions. 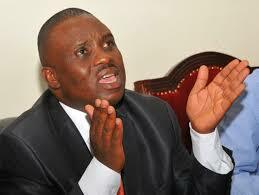 Lukwago will be joined in the campaign by Dr Kizza Besigye, the former FDC Presidential candidate. Other key players will be Ibrahim Kasozi (Makindye East MP) and Mohammad Nsereko, among others. Kasozi said he wants the matter decided through a referendum. “We shall mobilize people to defend the Constitution. Once we allow Mr Museveni to amend the Constitution, Uganda will be like Somalia,” Kasozi argued. But NRM legislator Adolf Mwesige who also doubles as the Defence minister says power belongs to the people who are free to elect leaders they want regardless of the age. If the article 102(b) is not amended, Museveni will not contest in 2021 because he will be above 75 years of age, the maximum age for one to contest for the Presidency. Some Ugandans living in the Diaspora are threatening to write to the donors to stop funding local projects if the age limit in the Constitution is amended. But Shaban Bantariza, the deputy government spokesperson, said Uganda no longer totally depends on foreign aid as it was the case before and, therefore, the country is free to make its own choice on any political matter.